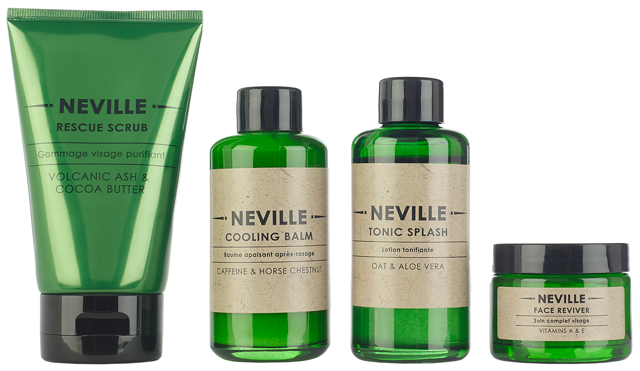 Recently arrived at Ape to Gentleman HQ is new brand; Neville. The 12 product lineup has been created with natural ingredients at the forefront of defence against life’s natural aggressors: grime, pollution, weather and stress, all known to wreak havoc on skin and hair. Created by the legendary British beauty and lifestyle brand Cowshed – who, incidentally are excellent in their own right (ask your girlfriend). 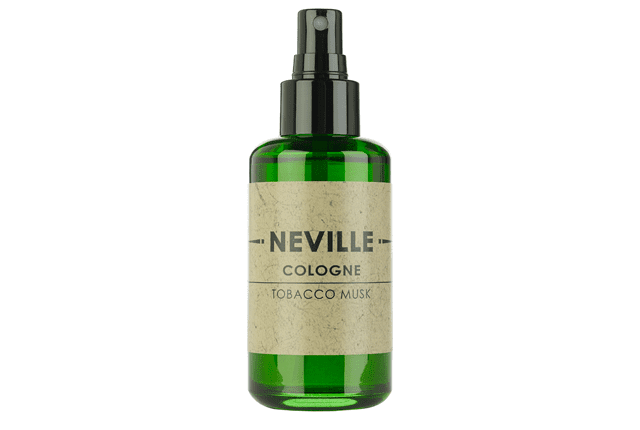 Neville is based on the experience steeped in British barber shop tradition and heritage. A simple green and brown colour scheme is classical in appearance, authentic and timeless. To match this philosophy, Neville will also be launching an old-style British barber shop in London, offering shaves, beard trims and haircuts. We tried the Tonic Splash and Clean & Shave – both of which were excellent. Revives and primes skin for a fresh, smooth shave. Volcanic Ash and Corn Granules act to resurface and brighten skin, whilst Coca Butter nourishes and conditions. Use as a weekly deep cleanse and shave prep for healthier, refined and refreshed skin. Follow with Neville Face Reviver. This treatment balm helps shorten post-shave recovery time. Combining the refreshing qualities of an aftershave in a moisturising lotion, this balm contains Caffeine to soothe and Horse Chestnut Extract to heal and reduce irritation. 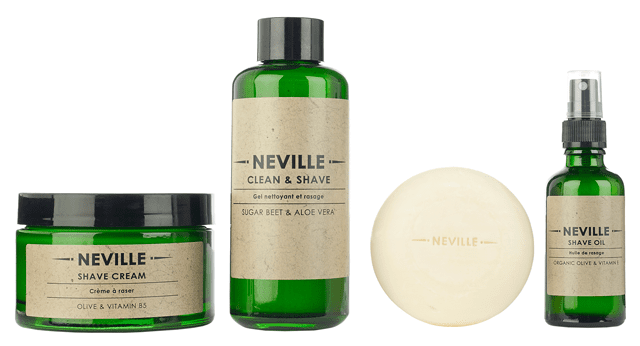 Use after Neville Clean & Shave, Shave Oil or Shave Cream. A face tonic that instantly refreshes, energises and tones skin post-shave. Infused with hydrating nutrients, Oat Kernel (rich in proteins and vitamins) to protect against inflammation and moisturising Aloe Vera, this Tonic Splash will soothe skin. Use after shaving and before the Neville Face Reviver. This high-defence, non-greasy daily saviour will shield skin and protect it against aggressive everyday elements. The blend of Vitamin A and E will help prevent inflammation repair damage, while Aloe Vera soothes, heals and hydrates thirsty skin. 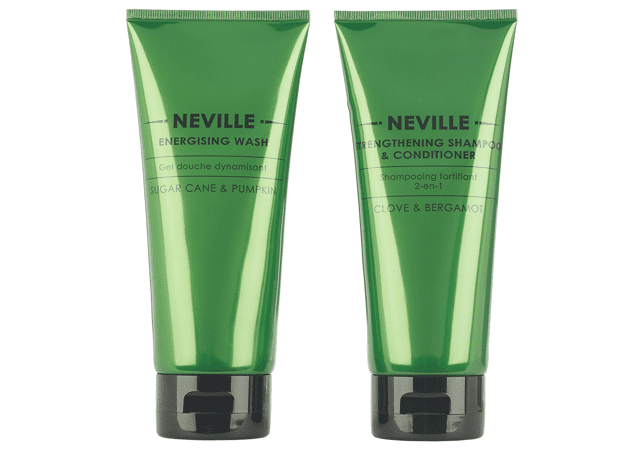 Use after Neville Clean & Shave. A 2-in-1 timesaver. Work into a thick, full lather to cleanse skin, then wash off or use the foam to shave before rinsing away. With moisturising Sugar Beet Extracts and Aloe Vera to soothe and repair, this formula softens and primes skin for a closer shave without irritation. Follow with Neville Tonic Splash. For the shaving traditionalist, there is no better ritual than lathering a shaving brush with a fine shaving soap. Enriched with organic Olive essential oil and Glycerine, its special formula creates a thick and creamy lather, nourishing and protecting your skin from irritation and razor burns. Follow with Neville Tonic Splash. A lightweight, skin nourishing oil that enables razors to glide effortlessly over skin, for a close shave without irritation. Natural essential Organic Olive and Jojoba Seed oils (packed full of Vitamin E) help soften skin and improve skin elasticity. Use with Neville Shave Cream for extra cushioning. Fight fatigue each morning with this rich lather body wash. Crafted with a botanical blend of Sugar Cane and Lemon to gently exfoliate and stimulate cell renewal, and Seaweed and Pumpkin to invigorate skin and boosts hydration levels. Created for the busy lifestyle needs of modern men, this 2in1 offers a quick fix solution to cleanse and strengthen hair. The dual-action formula helps to increase hair retention and reduce loss and breakage. Seaweed Extracts hydrate, Clove and Bergamot fight anti-oxidants, whilst Amino Acids revitalise and repair the hair and scalp. A woody oriental scent that is full of character and quintessentially masculine. Top notes of Bergamot and Grapefruit combined with middle notes of Clove and Frankincense combine with deep base notes of Vanilla and Cedarwood. 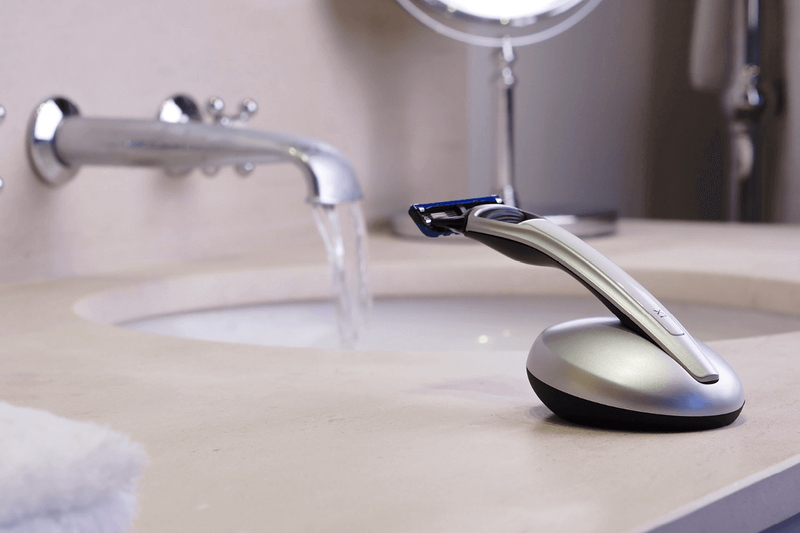 A 3-blade razor with a timeless design. Created from high-grade bespoke green resin, the conical handle ensures a comfortable grip whilst shaving. Compatible with Gillette® Mach3® and Mach3® Turbo blades. 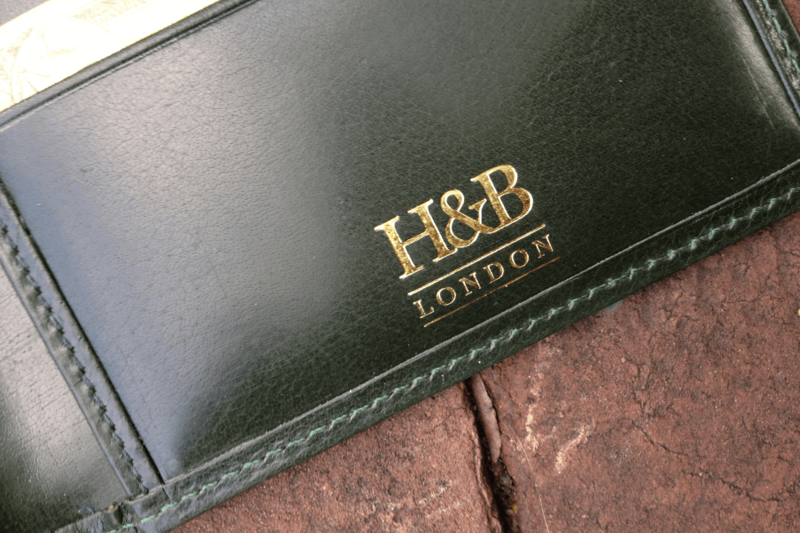 Neville will be exclusively available to Soho House Members and Shoreditch House Hotel Guests in Barber & Parlour, a brand new space in Shoreditch House. 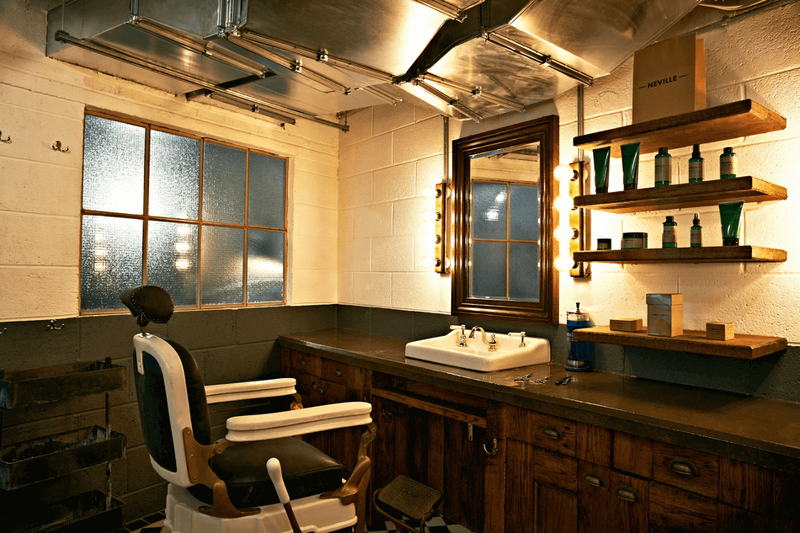 Barber & Parlour will offer grooming treatments for men and a blow dry and styling service for women.